We have had a very lovely weekend here as my daughter Ellie has been up from Uni visiting – we have been for a bit of retail therapy, out for a couple of lovely meals and finally got to go to the Quilt Museum in York! 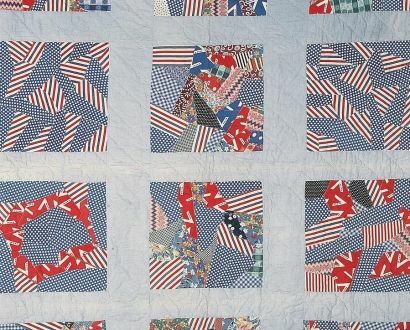 I wanted to go to see the Wartime Quilts exhibition which is only on for a couple more weeks – Ellie really likes that period and since I like quilting particularly for the history side of it I thought that it would be really interesting to see this display and it was. There were about 15 quilts on display – mainly those that were made by the Canadian Red Cross to send to families who had been bombed out of their homes. All were very utilitarian being made of dress fabric, suit fabric and in one case pyjamas and all well-worn which obviously means they were well used and appreciated which was lovely to see. There were also comments with the quilts from those people who had received them – mostly when they were children and that was very moving reading their accounts.There was also a quilt made by German prisoners of war which again was very thought provoking.The patterns used were varied, Nine Patch, Dresden Plate, Fans, Hexagon Flowers and lots of Crazy Patchwork with some lovely embroidery. As usual no photos were allowed so am sharing this one from the web site. I know I have said this before by I am constantly reminded how textile history is our history – it is not just about someone’s hobby, or an outdated craft – these carefully preserved artifacts tell stories about the reality of all sorts of very sad and in other cases very joyous occasions. We use the expression the ‘fabric of our lives’ and in these many pieces that I see in all sorts of exhibitions, historic houses and museums we see just that. I have also been busy on other domestic fronts – Ellie and I made huge batches of veg chilli which is now in the freezer for the final supper at the end of the Marsden Jazz Festival which is this coming weekend. I volunteered to cater (I miss doing Scout Camps!) for our Sunday meal. I have got my rota of duties (mainly doing the office and band liaison) which is great as I will get to watch about 6 different bands over the weekend so am really looking forward to that. We went out to Marsden last night for a final meeting about the involvement of the local community radio station and them the kids joined me for a very lovely meal at Mozarella’s pizza and wine bar there. 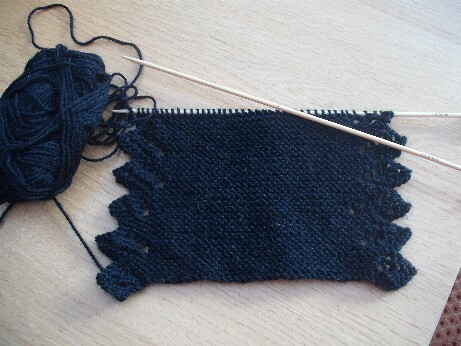 I have also been busy on my knitting and stitching – I have made up more patchwork trees and tree kits and have finished the first of my Autumn exchange pieces – I have tried a new form of finish this time using my new sewing machine (which is still working wonderfully!) 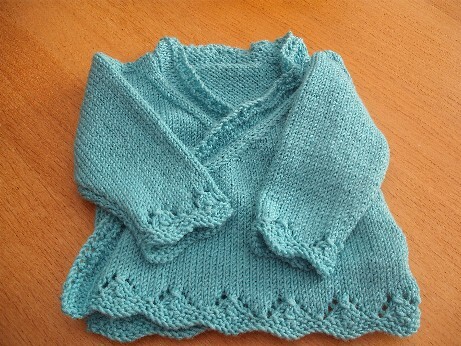 but cannot show pics till it has made its way to the USA – am posting on Fri.
Have finally made up the second version of the baby cardi using the Sublime wool (first version is here) – all it needs is a button and ribbon.For details of the pattern click here . 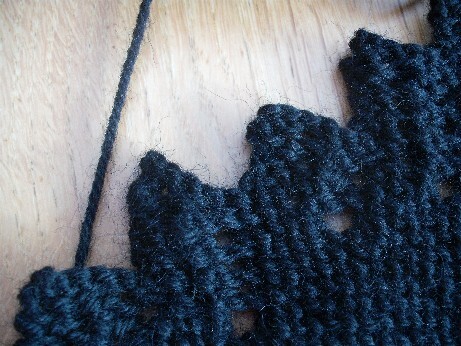 I have also have started on a new set of wristwarmers as an Xmas pressie – these are the Frothy Gothy Wristwarmers from a freebie on Ravelry – a very easy and striking knit – I love all the little points and it is very easy to do. Well I have a busy week ahead at work and will be in Marsden all weekend jazzing it up! Please pray for fine weather for us!